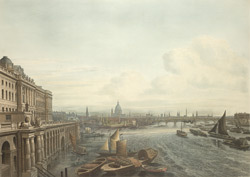 A view of Somerset House from Waterloo Bridge. This view also shows traffic on the river and further downstream is Blackfriars Bridge. In the distance there is the outline of St Paul's Cathedral, the Monument and many London church towers. Somerset House was a former Tudor and Stuart Royal Palace, which was demolished in 1775. It was then rebuilt by architect Sir William Chambers as it was intended to be used as government offices. It was the home of the Royal Academy of Arts from 1771, the Royal Society from 1780, the Society of Antiquaries from 1781, and also the Royal Navy and Stamp Office. The riverside wing belonged to the Royal Navy. Sir William Chambers also built a raised riverside terrace which can be seen in this view.